I mentioned yesterday in the post with 10 Quick and Easy Elf on the Shelf ideas for busy nights that I would post how my Elf is going to return this year. So our Elf will be back on the day after Thanksgiving and I plan to have him out first thing in the morning. I thought it would be cute to make some sort of fun breakfast thing courtesy of the elf. I made these doughnuts which literally take 10 seconds to put together and they are so darn cute! The girls are going to love these! I never give the kids stuff like this for breakfast so it is going to be even more exciting to see these on the table. 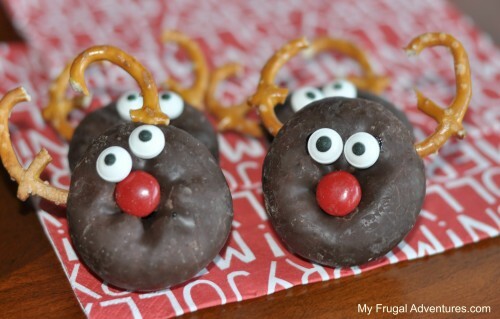 These would be a perfect alternative to cookies to leave out for Santa on Christmas Eve or make a few of these for Christmas morning too. Urg- my girls can really be stinkers sometimes bickering and fighting and arguing so hopefully this gets us off on the right foot to enjoy the holidays and focus on all our blessings. Oh and back to these doughnuts- they are super cute. I put one on my husband’s dashboard this morning before he left for work. I think they are adorable. Super easy- just lightly push an M&M or other red candy into the hole of a small doughnut. Next split a pretzel in half to make antlers. I had to use one pretzel for each side because of the way they break apart. I used a tiny dab of tube icing as an adhesive to stick on the Wilton candy eyes. You can also melt chocolate chips, use a dab of peanut butter or a reader just recently suggested Nutella. If you don’t have the little eyes you can use a dab of black frosting or mini chocolate chips for eyes. All of those options are really cute. Seriously takes just seconds to put these together and look how cute they are! See more Elf on the Shelf ideas here. And see more fun Children’s crafts and recipes and other fun Christmas stuff on my Pinterest board. Thank you for sharing this idea! I knew when you first posted it, I had to do it! Like you, donuts are a major treat at our house! And what’s funny, is we also named our elf Charlie last year when he first arrived! Thanks for this great idea. Just finished with it, and my kids will be SO excited to wake up and see him tomorrow!